What does it mean to be a GI Associates patient? From the front desk check-in to getting ready to return home, you will be met by dedicated professionals whose main concern is your health, comfort, and well-being. All of our physicians are board certified in gastroenterology, having accumulated at least six years of training after medical school. The gastroenterology training experience is far more intense than that undertaken by general surgeons, internists, or family practitioners who decide to add endoscopy to their practices. Our physicians are trained to interpret and treat the conditions they identify and uphold the safest level of endoscopy. 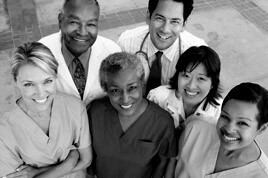 The physicians who make up GI Associates have been trained at some of the finest, most prestigious universities in United States, and this diversity allows our physicians quick access to multiple sources of expertise, high level consultations and opinions without having to leave central Mississippi. This expertise and extensive training is not always present in hospital based endoscopy, as many of the physicians there may not be board certified or may not have extensive training in gastroenterology and therefore cannot provide the quality and safety that GI Associates can. The GI Associates Endoscopy Center (all three locations) is the only out-patient facility in the region to be recognized for the American Society for Gastrointestinal Endoscopy as a Center of Excellence. We have also been awarded the certificate of accreditation by Accreditation Association for Ambulatory Health Care. A three-year accreditation is the maximum bestowed by the AAAHC. Our physicians participate in clinical studies that provide GI Associates the latest information about medications and scientifically based therapy. GI Associates is recognized nationally as an innovative, progressive practice that helps to provide patients with the most up to date information and treatments possible. GI Associates monitor physician quality indicators such as polyp detection rates, withdrawal times and complications. These results are used to strive to achieve a level of care that meets or exceeds national standards. Many hospitals do not monitor these results and have no oversight into the quality of their services. Recent studies have proven what we have always known - patients get better results when using a Board Certified Gastroenterologist. Other physicians may offer GI procedures as "part" of their services. But at GI Associates, that is all we do. This is definitely an area where experience matters. GI Associates strives to do one thing and to do it well. Hospital outpatient departments cannot always provide this focused attention as they are trying to accomplish many things at one time. Time is precious and the physicians at GI Associates understand. Our patients can expect to be in and out of our facilities in about 2 hours. In a hospital endoscopy department it could take anywhere from 3 or more hours to get in and out. The GI Associates in-center sedation service allows you to experience the safest level of sedation and comfort during a procedure. This is extremely uncommon in a hospital setting as anesthesia services are only used upon request. GI Associates employs three full-time pathologists whose sole job is to provide the highest level of care for our patients. Many hospitals have a general pathology services, but often there is not pathologist whose focus is gastroenterology. At GI Associates, your pathology is usually completed in 24 hours and your initial results and procedure notes are sent to your primary care doctor within 48 hours. In addition, a GI Associates gastroenterologist will review your case to make sure there is no need for additional follow-up with you or your primary care physician. HistoryWe have built a successful practice because we serve the best clients. In 1981, Dr. James H. Johnston, III, Dr. Billy W. Long, and Dr. James Q. Sones saw a need for gastrointestinal care in the jackson metro area. They organized GI Associates and in 1987, relocated to a central location in Jackson. The Gastrointestinal Associates Endoscopy Center, an outpatient procedure facility was built in 2001 to provide patients a state of the art facility with the latest technology combined with the highest level of service. The practice has expanded to include additional board certified Gastroenterologists and other specialized staff plus various outpatient procedures and clinical trials of new treatments. Growth and change are a constant for GI Associates because their goal is to provide patients with the highest and most comprehensive quality of service with a caring approach. In 2016, GI Associates made the decision to build a new building that would house the clinic, procedure areas, infusion, imaging - all under one roof. This move accomplishes three key principles of our practice: Patient Satisfaction and Patient Convenience at a Lower Cost. Conveniently located at 2510 Lakeland Dr. in Flowood MS.
GI Associates is the largest gastroenterology group in Mississippi and is one of the largest in the southeast with over 350 employees including twenty-eight gastroenterologists and three pathologists on staff. These physicians have a long standing history of dealing with digestive disease management, diagnostic and therapeutic endoscopy and preventative health care management. When you have your first GI appointment with one of our doctors, you will notice that the quality of care is coupled with a warm, friendly environment. If you have questions, feel free to contact us.